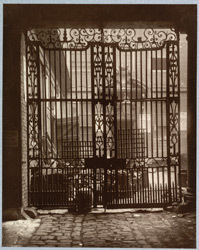 "The iron gate and courtyard of a very fine mansion, demolished in 1875 or 1876. The house and its contiguous warehouses and courtyards, occupying a great area, were for many years occupied by a firm of wholesale Druggists, Messrs. Baiss Brothers, who always most courteously allowed strangers to see the house. It was no doubt in its day - the beginning of the eighteenth century - the residence of a great merchant. The fittings and decorations of this house were of a very sumptuous character. A great room on the first floor was panelled with cedar; the grand staircase was particularly fine, the landing being of parquetry, and the walls handsomely decorated by Thornhill or his assistants. These wall paintings are now in South Kensington Museum."